A solid card of Thursday night NHL action features this Central Division matchup between the second place Nashville Predators and third place Dallas Stars. Although these teams are #2 and #3 in the divisional standings they have markedly different goals for the remainder of the regular season. The Predators stand at 68 points and are trying to run down the Winnipeg Jets who currently lead the Central with 71 points. There’s also the matter of catching the other Western Conference teams ahead of them in the schedule–Calgary leads with 73 points and just ahead are the San Jose Sharks with 69 points. The Stars have been playing very good hockey of late winning five straight games but are still 8 points back of Nashville. The Jets and Predators are pulling away from the rest of the division–after Dallas, Nashville’s nearest Central Division competitor is Minnesota 11 points back. Dallas’ goal is to stay well inside the cutoff for playoff qualification. Right now, the Stars lead 7th place Western Conference team Minnesota by 3 points and the 8th place Vancouver Canucks by 6 points. On the outside looking in is a logjam of teams all within single digits of the Stars including St. Louis (7 points back), Colorado (8 points back), Edmonton (9 points back), Arizona (9 points back), Chiacgo (9 points back) and Anaheim (9 points back). Even last place Los Angeles is within striking distance just 11 points back of the Stars. Nashville has all of the talent in the world but sometimes struggles with focus. That shouldn’t be a problem here with nothing on deck but games against St. Louis in a home and home series and a matchup against lowly Detroit. It should be autopilot for Smashville until Valentines Day when they begin a tough three game road trip with stops in Montreal, Vegas and a rematch against Dallas. These teams just played each other last Saturday night here at Bridgestone Arena with the Stars winning 3-1. That along with Dallas’ recent run of solid play should have the Predators’ attention. Nashville has been busy in advance of the trade deadline with a couple of solid pickups–Brian Boyle from New Jersey and Cody McLeod from the New York Rangers. Both should help the inexplicable struggles of the Nashville power play (12.9% for #30 in the NHL). Otherwise, Nashville remains a very strong team in all phases of the game. The Preds rank #11 in goals for (3.09 per game), #3 in goals against (2.55 goals per game against) and #11 on the penalty kill (81.2%). 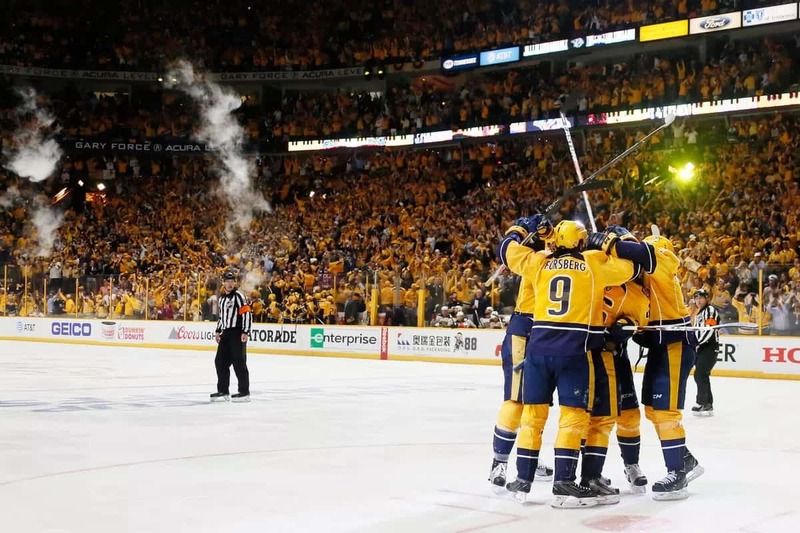 Nashville’s recent pickups of Boyle and McLeod signal that they’re getting ready for the stretch run and a hopeful return to the Stanley Cup Finals. Look for the Predators to beat Dallas in a ‘quick revenge’ game back on their tough home ice.